This is a bit of a continuation from my previous post. If you have read it you will know that I made my friend's new baby girl a sweet, white lace blouse on her arrival. I also wanted to make her something completely different that was a bit more 'fun', and the tea party sundress by Oliver + S fitted the bill. My mum has a fabric business and one of the huge benefits for me is the regular buying trips she makes to Japan. She got me a heap of stuff in January - mainly Lecien - for about $4 a metre. Crazy! I would really love to get over there one day, but I digress. One of the fabrics she brought back last time was two metres of Cosmo Textiles dolly print. 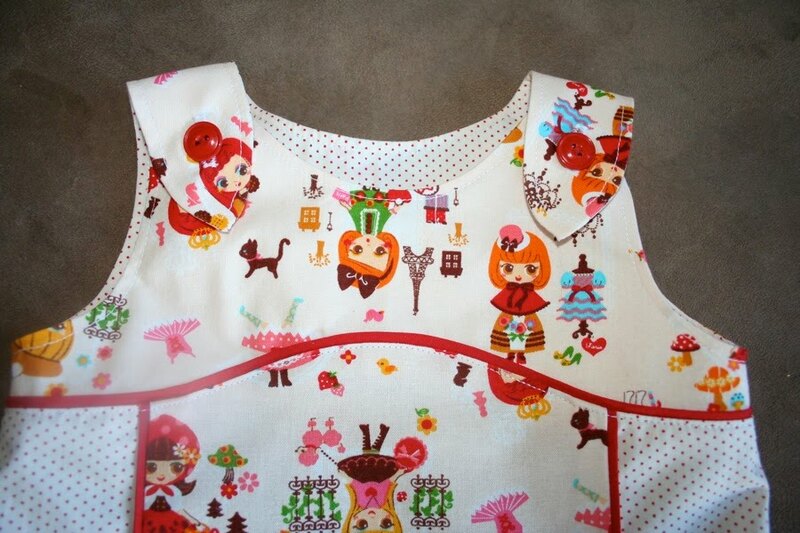 It's ridiculously cutesy and girly, with little dolls in Paris printed all over it. I decided to use this print for the yoke and centre panel, with a plain fabric on the outside to tone it down a bit. The basecloth is actually a really unusual colour, it looks cream, but is actually the faintest blush pink, and it was really hard to match. 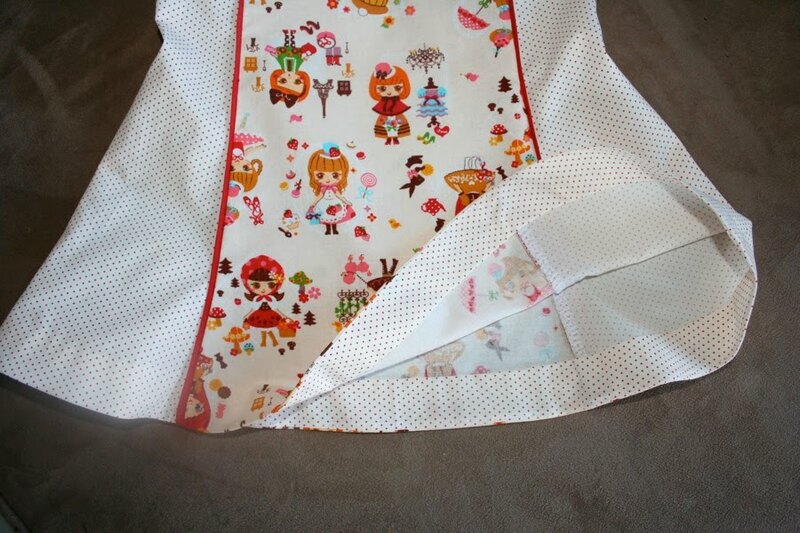 In the end I chose a cream and red pin-prick polka dot from Sevenberry - another great Japanese fabric company. The red and cream kind of gives the illusion of pink, and I think it works quite well with the dolly fabric. I decided to go ahead with the optional flat piping and am glad I did. I think this dress really needs it, or it would risk look a bit washed out. The pattern was a dream. This was one of the first Oliver + S patterns I ever bought (along with the Birthday Party dress) although I have never made it until now. I originally bought it in the larger size range and had to purchase the smaller sizes as I really had my heart set on making it in a tiny size. This one is size 6-12 months. The dress came together easily, as is the case with Oliver + S patterns. I sewed it in a night, after a spectacularly rubbish day at work. It was so lovely surrounding myself with a gorgeous pattern and lovely fabric, knowing that it would work out. I felt so much better by the time I went to bed that night. I quite like the flared skirt but think that next time I will tone it down a bit, particularly as I will make it for an older child (my daughter!) next time. The finished dress. I'm glad I went ahead with the piping as I think it makes the dress. Yoke detail. I used basic red plastic buttons. I did actually cover some using the Sevenberry dot fabric, but it didn't look right. And that hazy area on the left of the photo is my daughter's fingerprint on the lens. She has a toy camera, but mine is far more exciting. The trademark O+S faced hem. 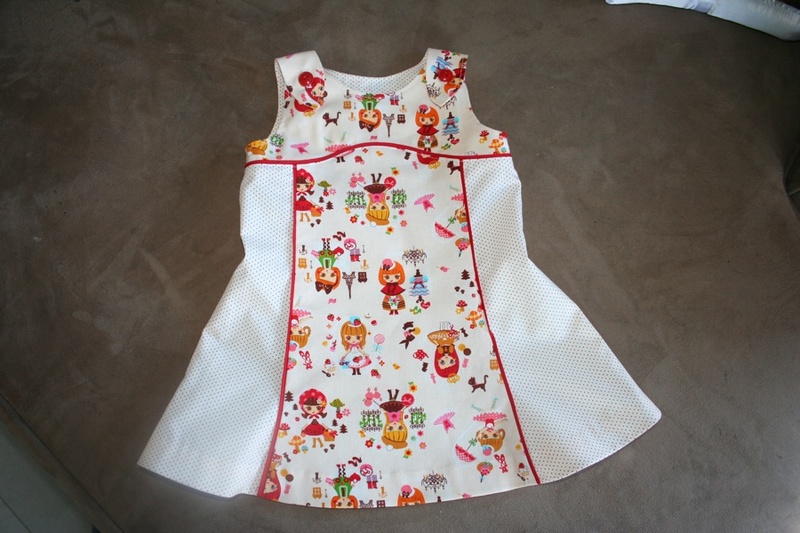 This was a little different to the faced hem of the birthday party dress as it's understitched. I like it. That's the cutest thing I ever did see! Gorgeous Claire - great fabric. How handy your mum owns a fabric business!! What a beautiful dress. Love those fabric choices. The piping is fabulous.